After riding around the city I sat on the platform at the Union Station DART train stop, waiting for the Red train to take me back to Richardson. It was late in the day (I had not brought my lights and had to get home before dark) and the sun was low in the sky. A late afternoon thunderstorm began to explode upward, the rising hot air spreading skyward, fanning out in a semi-circle that covered the sun. Still, the light filtered through, glowing like a fireball over the reflective ridge of the Hyatt Regency Hotel. It was a brief image, an ephemeral phenomenon – the water vapor boiling away as I watched. And then my train arrived. 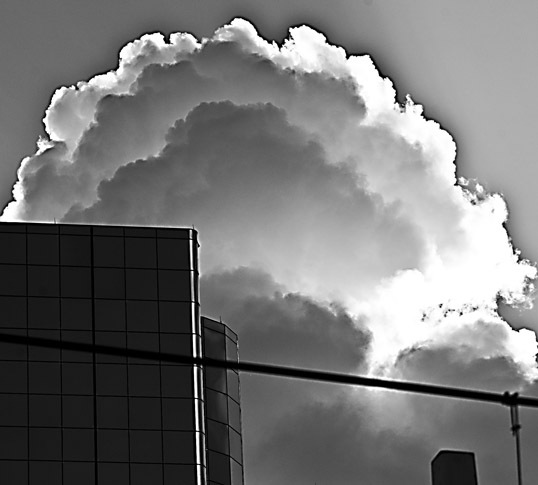 This entry was posted in Photography and tagged b&w, black and white, cloud, Dallas, Texas, weather. Bookmark the permalink. Incredible image and reflectionI I had the same type of “cloud phenomena” happen to me here in Baltimore last week. Check my Twitter feed (@rusvw13) for the image “Voldemort in Towson?” You will see the similarities almost immediately. Thanks, also, for stopping by my blog, Bill. Good to connect. That’s a cool photo – love the building and the horse sculpture too. The horse sculpture is outside a restaurant called PF Changs. It adds to the mystique, doesn’t it? 🙂 Thanks for checking it out!